No public or university library can match the feeling that a personal home library can offer. The books that we read are more than just a hobby and so they need to be celebrated and displayed in a home. You don’t have to have a large mansion to curate a home library of your own. All you need is some clever planning and implementation. Give your hardcovers and paperbacks the attention they deserve with these amazing library ideas for your home. The living room is the place where the whole family comes together. Most of our time is spent on the sofa watching television or sipping coffee while admiring the view outside our windows. Setting up a traditional library behind your couch is a great idea as it makes your living room look more cosy and personal. It’s also a nice way to showcase your collection to guests who walk into your home. If you’re someone who enjoys the quiet time away from the world to delve into a good piece of literature, then this is a perfect idea for you. This arrangement will give you the ultimate European feel. The warm oak wood against the dark background creates a classy look. With a touch of greenery here and there, this place is a haven for all book lovers. Do you have a spacious dining room with a lot of unused space? 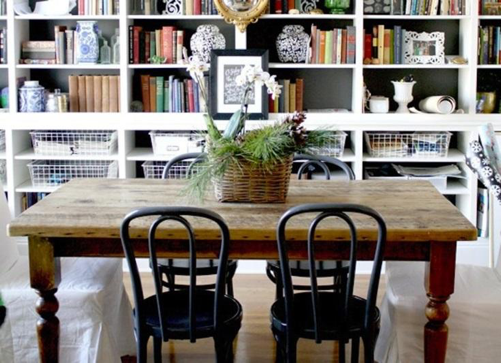 Capitalise on this space to your advantage by creating your own home library by the dining table. If you’re by yourself and craving company while having your meal, pick up a book and remedy that right away! After all, is there any better company than a book? If there are bare walls in your dining room, this is the perfect place to add a few shelves. It’s a practical idea and saves a lot of space. You can paint your shelves in a colour that compliments the interiors of your dining room. Placing indoor plants by the side will also improve the aesthetics of the room. This small home library will definitely serve as good conversation material when you’re having guests over for dinner or lunch. What’s cosier than sliding under a blanket with your favourite book in hand? 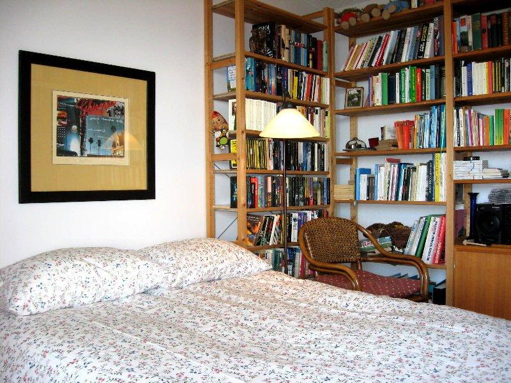 Having a library by your bedside makes perfect sense for those who love reading before going to bed. This arrangement can save you from going great lengths to fetch a night time read. You can mount wooden shelves to the walls and stack them neatly by genre, author or even categorise them according to the colour of each book. It’s an ingenious décor idea for your bedroom. A lamp can be fixed to the side of the bookshelf or the wall as a source of light. You can throw in a comfy chair if you prefer reading up straight instead of lying down. This will create a compact reading corner where you can casually unwind with a book. If your apartment is blessed with a large closet, you can transform this space into a relaxing home library. Away from all the noise, you can read a good piece of literature in peace. You can install overhead lights or even add a chair or a bean bag if there is enough space. 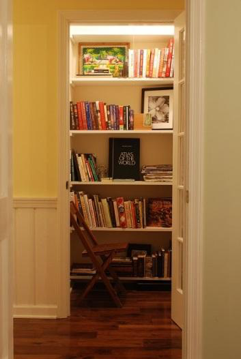 This is a great idea for people who spend long hours reading and like a secluded space. You can snuggle up with a cup of hot chocolate by the side and spend the night with your favourite book. If the other tips don’t work out for the layout of your apartment, you can always resort to customising shelves according to your house plan. You can place these shelves near your office desk or study table and stack them with the books that you read the most. 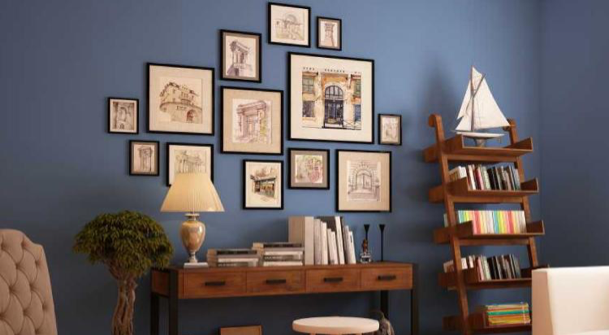 Decorating your gallery wall with photographs of your family, beloved pet or a painting of your favourite artist can instantly enhance the beauty of your home. Home libraries are not only for avid book readers, they can also be used as a space to relax and stimulate your mind. It’s best to set up a home library when you have kids around as it helps them develop a reading habit early on in life. At Lancor, we have apartments with optimum space utilisation, giving homeowners the freedom to transform the abode in any way they wish.